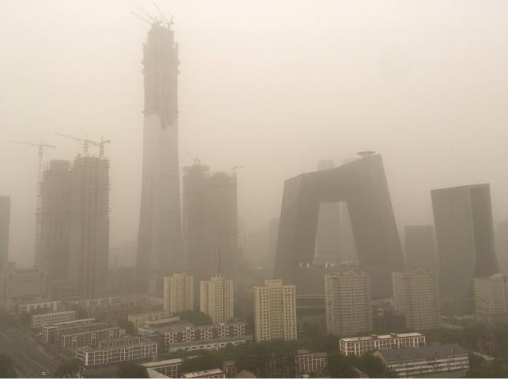 A major dust storm engulfed northern China and Beijing on Thursday, prompting authorities to cancel dozens of flights and urge children and the elderly to stay indoors. Buildings were shrouded by the greyish haze in the capital while residents who ventured out covered their mouths and noses with masks and bandanas. At least 48 flights were cancelled, including six international routes in Asia and Russia, according to the Beijing Capital Airport's website. The storms regularly occur in spring, when winds from China's northwest blow loose, dry soil and sand into the city from the Gobi desert, coating urban areas with a layer of yellow grime. Visibility in Beijing was as low as one kilometre (0.6 miles) in the morning, according to state media. Levels of large particulate matter, known as PM 10, hovered around 900 in the late morning, according to air quality monitoring website aqicn.org, or nearly 20 times the World Health Organisation's recommended daily maximum exposure. The high levels pose a threat to human health, and the city urged children and the elderly to stay indoors. The storm will cover large portions of the country's northwest through tomorrow, according to state broadcaster CCTV. Beijing has attempted to combat the phenomenon with greenbelts around the city, but increased desertification in the country's northwest have frustrated the efforts.